Even in the good years, Jeff Tutein's job as a harpooner has never been easy. Perched above the ocean on the bow of a 31-foot lobster boat, Tutein aims at Atlantic bluefin tuna in the waters off Cape Cod, then heaves a 12-foot-long spear at a giant fish swimming as far as 25 feet away. He describes a typical voyage as 12 hours of boredom punctuated by moments of utter chaos. Tutein used to catch 25 fish per year. But now the giant bluefin tuna are few and far between, and sometimes he scans the water from his boat, the Jeanne Maria, for hours on a perfect fishing day -- light winds, calm sea conditions, and sunlight -- and returns to his home in Rockport without a single fish. "It's hard to see a future in the ocean now," said Tutein, 51. "In fishing, there's so many different factors involved, and they're all out of a fisherman's hand." Commercial fishermen across New England who have hunted the once-plentiful and long-desired bluefin tuna for years echo Tutein's frustration. They say they are ready to give up after a four-year plunge in the population of bluefin tuna longer than 6 feet, the minimum size fishermen are allowed to sell. Between 1995 and 2003, they brought in around 5,000 bluefin a year in the waters between Maine and Rhode Island. But since then, fishermen have observed far fewer of the giant fish, and the catch has declined as well. New England fishermen landed just 565 bluefin tuna in 2006. 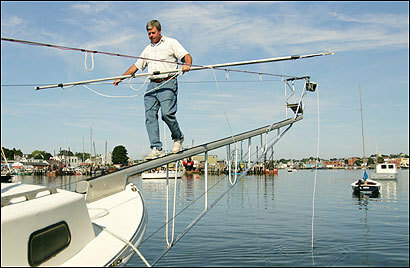 Michael Genovese, 53, of Cape May, N.J., is a third generation fisherman and Gloucester native. For years, he sailed New England waters in a purse seine boat, a vessel designed to catch hundreds of the giant fish in its 4,000-foot-long net. This method was once so effective that only five of the boats are allowed to operate in the Atlantic in a season. As recently as 2001, Genovese would leave New Jersey in July and would not return until November, scooping up hundreds of fish throughout the voyage. Last season, his boat, the White Dove Too, was the only one to catch any tuna, taking in just 10 bluefin the entire season. This year, he has put the vessel up for sale. "My partners decided they don't want to put any more money in the fishery," he said. "Traditions are going by the wayside. Life is changing." The demand for bluefin, a renowned Japanese delicacy, grows each year, especially in the United States, where sushi has become mainstream fare. Scientists do not have all the answers, but some have come up with theories for the declining population here: overfishing in the Mediterranean Sea, changing water temperatures that have caused the herring that form the staple of the bluefin's diet to migrate out of the region, or the bluefin's migration to Canada. "It's shocking, and it has a huge economic impact on coastal communities," said Molly Lutcavage, director of the Large Pelagics Research Center at the University of New Hampshire. "And then there's the cultural significance. We appear to have lost already our entire bluefin fishery, which has been around for a long time." Fishermen say the bluefin are a unique species with incredible strength, capable of bursts of speed. The largest weigh more than 1,500 pounds and exceed 10 feet in length. Tuna make up less than 10 percent of marine life caught worldwide but has the highest value, especially in Japan, according to the Bluefin Tuna Program, which Lutcavage oversees at UNH. The meat can sell for as much as $50 dollars per pound. Atlantic bluefin tuna caught in New England waters totaled 88 percent of the US catch in 2002 and was worth $14.3 million, according to the program. Smaller bluefin tuna are thriving in local waters. But the fishermen cannot legally sell them, because of international rules requiring them to allow the fish to grow to their full size. Researchers are studying juvenile tuna populations to discern whether they are being caught in distant waters -- the tuna can migrate across oceans during their lifetimes -- before they fully mature. The commercial bluefin industry is regulated by the International Commission for the Conservation of Atlantic Tunas. Founded in 1969, the commission researches and monitors tuna stock and sets quotas for each participating nation. For 25 years, the catch limit in the United States and Canada has been much stricter than in the eastern Atlantic and the Mediterranean. Scientists on both sides of the ocean are beginning to question the restrictions in place and whether overfishing, which they conclude is occurring in the Mediterranean, is depleting the tuna source here. "The sad part is you don't see any young recruits, and you can't blame them," said Bob Campbell, 51, who grades and processes tuna for Yankee Fisherman's Cooperative in Seabrook, N.H. "We all hold hope that it's a cyclical thing, that the cycle will be broken at some point in time and these fish will come back in here and there will be a decent fishery again." Scientists like Lutcavage hope they can figure out what has driven the giants away, but the issue is complex because the fish have varied migratory patterns, she said. Researchers are currently monitoring them with pop-up satellite tags but have relocated their studies to Canada, where a larger population of bluefin tuna now lives. But New England fishermen are not allowed to fish there. The view from above mirrors what fishermen on the water describe, said George Purmont, 62, of Little Compton, R.I, a pilot who spots tuna for the three remaining purse seine boats. Purmont, who has been flying since 1972, said he did not spot a single school of adult tuna last season. "You would go to these historic places and you wouldn't see anything," he said. "People's greed and lack of responsibility have led to the decline and on the verge of the demise of these giant and magnificent fish." Although Purmont's livelihood is in jeopardy, he said he will not give up like the other fishermen. The industry, he said, has an obligation to help researchers study tuna and possibly slow the stock's depletion. "You can't really just back out and say I can't afford to do it now," he said. "You still have to make every effort you can, not just for you but for the resource."